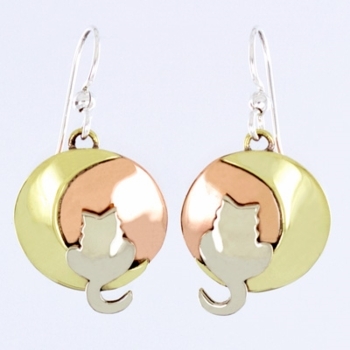 Sweet mixed metal moon cat earrings from Far Fetched! These cat earrings feature a cat enjoying the night in the curve of a crescent moon. The curve of the moon juxtaposed with the cat’s tail makes for a lovely design and a pretty shape hanging from the ear. The nickel, brass and copper adds a wonderful depth and natural color to the design.